29 unusual ideas of what to do in Indonesia! Dragons still exist on the Earth! The last of them inhabits the territory of the Komodo National Park in Indonesia. 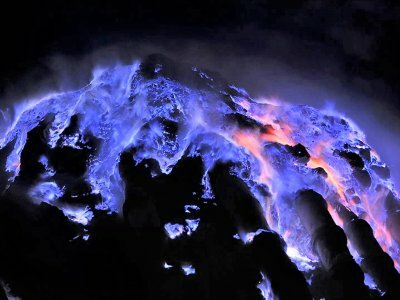 Every night, the Ijen Volcano crater, on the island of Java, is ignited with blue flame.  This spectacle impresses deeply. Find out how to go rafting independently and what to expect from the adventure. Take an exciting ride on a 5-tonne elephant in a big zoo-kind park where animals walk slowly and lazily in their natural habitat. When the sun is rising the fog is thickening at the bottom of the volcano hill; and at its top you can see Mount Agung. You'll find everything for exciting surfing on beaches in Canggu area - lots of surfing spots, board rental, surfing classes and camps. Complex of pools with water temperature from 20 to 50°C is situated near Kintamani village. 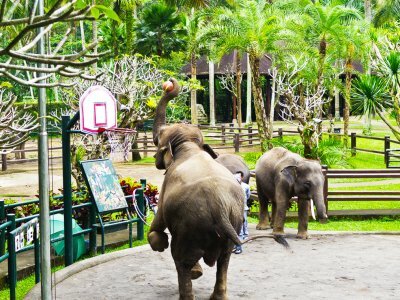 Come in the park any day from 8am till 6pm and wait for the elephants to appear on the basketball court. 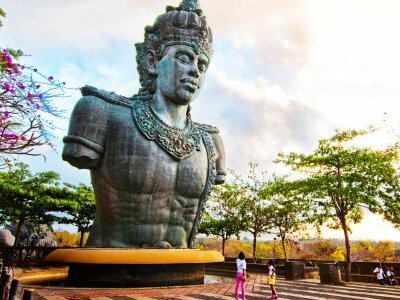 The bust, Vishnu's arms and Garuda's head all are the parts of the 150-meter sculpture-to-be in Garuda Wisnu Kencana park. 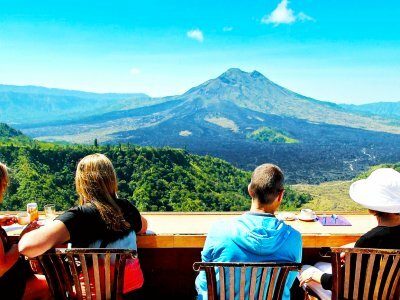 The terrace of Madu Sari Restaurant overlooks Mount Batur. You can drink coffee and have dinner any day from 8am till 4pm. Take some bananas or bread and don't take your personal stuff - the monkeys can grab it as well. The park is open from 8:30am till 6pm. The lake at the Gitgit waterfall is placed 500 meters from the main road leading to Singaraja town. A cup of kopi luwak costs Rp 50000 in cafes of Ubud town, in Europe and America it will cost you $50. Men in Tenganan village fight for brides-to-be with pandan sticks and bamboo shield. The fest takes place in June and lasts for a month. On the first day of Balinese New Year bachelors of Sesetan village try to kiss as many unmarried girls as they can. To add more excitement couples are poured with cold water. This day you can't go out, turn on lights and work from 6am to 6am. All public places including airport are closed except for hospitals. This is how the Balinese celebrate New Year. Jockeys of the best buffaloes on the island compete for the Governor’s Cup. 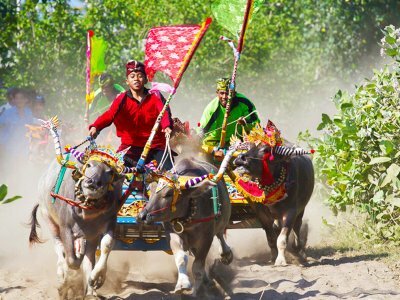 The races take place monthly from July to November in Jembrana Regency. Ubud town is perfect place in Bali to get relaxed and practise meditation. 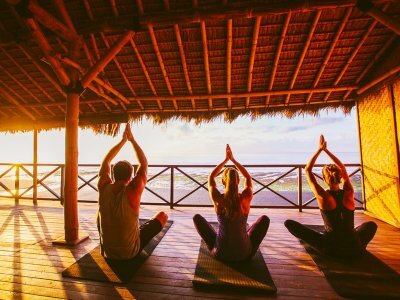 One group yoga class costs about $10, private class at your place - $30-50. The deceased in Setra Wayah cemetery in Trunyan aren't buried or cremated, they're covered with cloth. Decomposing bodies don't stink as a sacred tree here removes putrid smell. Go diving in Pemuteran Bay to find 25 Buddhist temples at a depth of 15 meters. You need a diver's license to take the activity. Go diving into 5-meter depth without an aqualung and diver's license. To arrange the activity come to any diving centre on west coast of Bali. A corpse is placed into a bull-shaped sarcophagus and burn. The ceremony usually takes place early in the morning. Balinese people hold Mepantigan in honour of the Goddess of fertility. There are also separate fights for tourists at the rice terraces in the area of Ubud town. Share your ideas of what to do in Indonesia with other travellers — together we'll make our travellings more interesting!